We have an intuitive understanding that objects do not change shape in time and space. We know that the coffee mug does not grow bigger as we bring it toward us and it surely does not cease to exist when we cover it with a newspaper. This knowledge, which is seen in infants as young as 5-months old is called object permanence. Without this information our perception of the world would be chaotic and frightening. But what are the neural correlates of this property? Turns out, this is still an open question, one that Arun Sripati and Puneeth NC from Indian Institute of Science in Bangalore investigated in the visual system of macaque monkey brain. It has been previously established that fundamentally, the visual information entering the retina is processed by two different streams. The “where/how” pathway and the “what” pathway. These pathways are hierarchically connected brain regions with neurons processing increasingly complex features of the visual information along the pathway. Object recognition has been localised to the “what” pathway, also called the ventral stream. At the higher end of this pathway is a structure called the inferior temporal cortex (IT). Earlier work on neurons in this area showed that IT cortex is vital for object recognition. Single neurons in this region respond for entire objects, but do not fire for constituent components of the object. For example, they fire when an image of a face is shown but not when the nose, eyes or lips are shown separately. 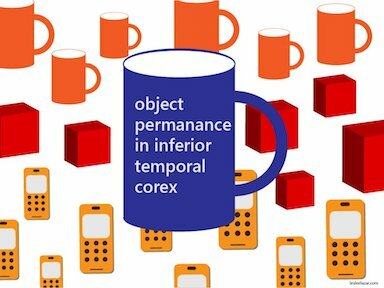 What Sripati and Puneet asked was whether the activity of single neurons in IT cortex correlates with the property of object permanence. To answer this question, they trained naive monkeys to fix their gaze at a central spot on a computer screen using juice squirts as reward. Then an occluder in the form of a brick wall moved towards the object and covered the object completely. Then the occluder moves away to reveal the object again. In “match” trials, the same object reappeared. But in “surprise” trials a completely new object appeared, breaking the expectation of object permanence. While the monkey viewed the stimuli, they simultaneously recorded electrical activity of neurons in the IT cortex in the monkey brain. They found that small group neurons (8%) in IT cortex fired when the object was shown after occlusion. Among this pool, there was a group that fired in the “surprise” condition and another to the “match” condition. This effect was a generalised property of the IT neurons as they did not fire for a specific object, but for many pairs that were tested. This shows that IT neurons keep track of an object and some respond to object permanence case and some to its violation. How do these neurons know that the object is the same or different? The authors posit that it could to be a memory based process as the neuron has to remember the object during the occlusion. They did find such a signal in single IT cortex neurons correlating to memory in a small group of IT neurons. This study adds evidence to the notion that aspects of high-level visual processing, especially object permanence are processed by single neurons in IT cortex. The lead author of the study Arun Sripati says, “Understanding how single neurons in IT represent objects will eventually help us devise better computers and help diagnose and treat disorders of high level vision in humans. Our goal is to understand why we are able to make computers play chess but are unable to make them see”. However, the authors caution that this might not be a causal relationship. Object permanence could very well arise from another area in the visual pathway and this information could be passed on to IT neurons.